You may, or may not have noticed that my blog was down for twenty hours Tuesday into Wednesday. It was a very frustrating time for JL, myself and even more so the hosting company for our websites. We just switched our websites to a new hosting location a few weeks ago. After years with one place, the service had declined significantly and the down time kept increasing. We were floored when this happened so soon after switching. The difference here was the new hosting company was on top of everything. They were in constant communication with JL and the other people that had their websites on this server. In the end, the down time was huge. However, the customer service thus far has been incredible. Things are still not 100% fixed. Comments are being moderated that had not in the past. In addition to that, the e-mail notifications of comments are not working at all. This means that I have to go to the control panel of my blog to retrieve comments and reply back to people. I am slowly catching up with this. On a brighter note, I am still working out every day. Since I started I only took Sunday off. Tuesday while upset about the down website, I did some research online for more Leslie Sansone DVDs. I went to Best Buys website and found that they were on sale. It was great that I could also track down whether or not the local store had the DVD that I wanted in question. When I saw that they had several in stock I packed JSL up and we went to the mall. When I arrived there nothing was labeled with sale prices. I grabbed two of the DVDs that were interesting to me and went to the register. Both of the DVDs scanned for $6.49 each! Needless to say I now own two new Leslie Sansone workouts. The workout that I was most interested in was the 5 Mile Slim Down. It had glowing reviews online. Fitness Magazine also voted this DVD as one the best for 2009. I had wanted this from the start , but could not find it locally before this. I immediately picked it up. Yesterday JSL asked me to "keek" = kick. He saw the DVD and wanted to walk and kick with me. So I put it on. I did about an hour which got me through mile 1, 2 and 3. All I can say is WOW! The third mile really worked out the legs with lunges and other more challenging moves, but I loved it. Oh my goodness, did I just say that?! What I really liked about this DVD was it was Leslie Sansone alone. She talked you through the workout and was not chatting it up with other people. It was a nice change from the other DVDs that I have tried. The other DVD that they had was another 5 mile workout. Thanks to the price it was a great time to buy it. Since I have been using them and would like variation it seemed like the perfect opportunity. I have not tried this one yet, but it looks great. I will update more when I have actually worked out with it. Seriously, where is the real me?! Or is this the real me? Maybe what I needed was to find the right workout that made me feel like I could do it. Leslie Sansone makes me confident about doing the workout. After I am done I feel energized and wonder when I will have time to do it again. This is new to me. I am the girl that used to cringe and hate PE in school. Now I look forward to sweating because I know that it means I am getting a good workout. Sure, I hope that it will help me to drop some pounds. 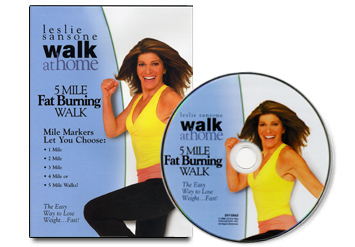 However, more important is that with the assistance of the Leslie Sansone Walk at Home DVDs I am getting my heart and the rest of my body back into shape. This will help me to be a better wife, mother and person in general. A perk is I am also going to be ready for the walking at Disney World in a few months. P.S. – Please note that the review of the Leslie Sansone DVDs is not being sponsored by anyone. This is a product that I found on my own (with some research), paid for the DVDs myself and highly recommend. Congratulations on working out every day. I’ve missed a few days this past week for various reasons. I’m always sad to miss a day at the gym. Sorry to hear about your hosting site. My internet is come and go since I am not staying at home at the moment. Thats great about your DVD’s I think I am going to look into some of her stuff. It sounds like a lot of fun. I have some workout dvds. They are dancing ones, they are fun but I can’t do them for very long periods of time, they are very very fast paced. Leslie Sansone sounds awesome I can’t wait to give it a try! Aubrey’s last blog post..Where the Black Mold Grows….. Switching hosting companies always comes with a few glitches. Glad to hear the IT support has been very helpful though, that’s not always the case.